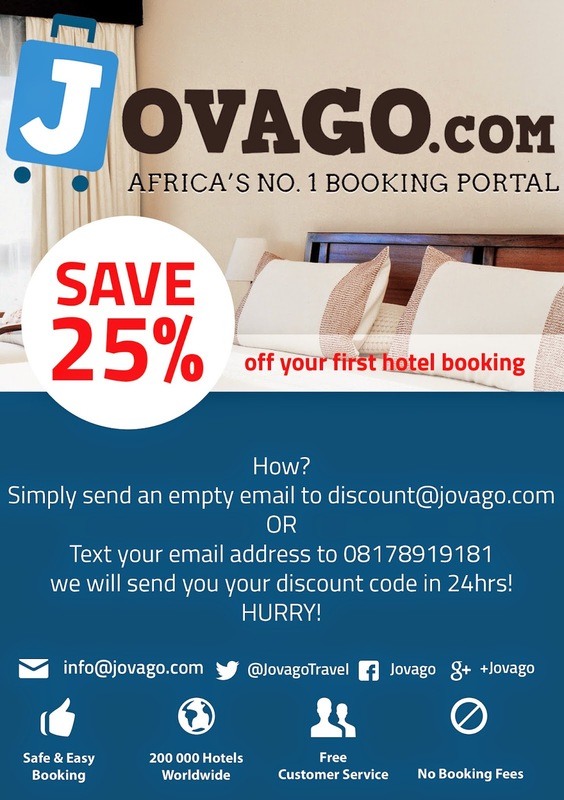 Jovago, Africa’s largest online hotel booking platform has commenced an email sign-up campaign which offers customers a 25% discount off all Nigerian hotels booked on the site. The company, Jovago, says this campaign is targeted at giving back to her customers who have contributed immensely to its growth. This email sign-up campaign requires everyone to either send their email address to the company number 08178919181 or simply send an empty email to discount@jovago.com. Everyone who does this will receive a unique voucher code within 24hours, offering them a 25% discount off any Nigerian hotel listed on the Jovago official website. Jovago which recently partnered with Nigerian Tourism Development Corporation as their official hotel booking partner and signed up Nigerian multi-award winning artist, Ice Prince as ambassador is poised to revolutionize the hotel booking space in Nigeria. Yesterday, 23rd July 2014, the company concluded an arrangement with Discovery Air, one of Nigeria's many domestic airline services, to commence a strategic and mutual partnership. For the first time ever in Nigeria, a domestic airline will list a hotel booking portal on its website, and travelers booking flights on Discovery Air will now be able to book their hotels right there on the site as well. With many more partnerships and promotions in the bag, this email sign-up campaign is just a tip of the iceberg. “One of our strong assets is identifying our customers’ needs and satisfying them as best we can. This is why we always create more avenues for our customers to save more while booking on www.jovago.com” Marek Zmyslowki, Managing Director of Jovago Nigeria said in a statement. Jovago.com is an online hotel booking service headquartered in Lagos, Nigeria, and founded by Africa Internet Holding and has MTN as one of the investors. Jovago, Africa’s No.1 booking portal, facilitates the booking process for its users to provide them with the best hotel booking experience with fast, transparent and easy-to-use services. Jovago has over 5000 local hotel listings across Africa and over 200,000 hotels around the world. Jovago is part of Africa Internet Holding (AIH). AIH introduces and accelerates the online shift in Africa – for its people and its culture. AIH has built up multiple web companies including: JUMIA, Zando, Kaymu, Hellofood, Lamudi, Carmudi, Jovago, Lendico and Easy Taxi. There seems not to be much difference to other hotel booking sites and discount comparisons. It seems just to claim being focussed on Africa. In fact, in big cities it works finde, but still most hotel business not everywhere connected in Africa.